*Dilly Dolls*: More Hunt Information! That's right! The vain hunt is right around the corner. And let me tell you something! You will be in awe of the awesome outfit that Oriana has put together for you all! I can't wait to get my hands on it! No pictures though. This one is just too juicy and you'll have to come to the hunt and find it yourself! But that's not all! 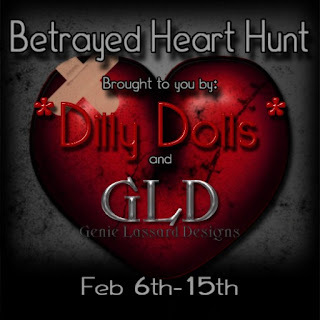 Dilly Dolls and GLD are teaming up for their own special hunt! The *DD* and GLD Hunt will include specially made and unique designs from both designers. Each one will hide a number of betrayed hearts containing pieces of the outfit around their own store. It's up to you to find all the peices to complete the outfit. The *DD* and GLD Hunt starts the same day as the Vain hunt on February 6th and runs through the 15th.